The Church of the Holy Trinity, located in Trinity Square in downtown Toronto, is located on the west side of today’s busy Eaton Centre. When the church was built in 1847, Henry Scadding, author of “Toronto of Old” (published in 1873), stated that just ten years prior to its consecration, the land to the south of the church was “fields,” and to the north of the church were swamps and dense forest. The area where the church was eventually erected was referred to as Macaulay’s Fields, as it is where the Macaulay family had built their home. The history of the Church of the Holy Trinity commenced when Bishop Strachan, who is today buried in St. James Cathedral on King Street East, received a donation of 5000 pounds sterling to build and maintain a church in Toronto. Conditions were attached to the funds—it was to be named the Church of the Holy Trinity, the seats were to be forever free and not designated for the use of a specific person. The terms also stipulated that 3000 pounds were to be spent on the building and 2000 pounds on an investment for the incumbent clergyman that would be appointed. The land for the church was donated by James Simcoe Macaulay. His house was relocated a short distance to the north to accommodate the site for the church. Henry Scadding wrote in 1873 in “Toronto of Old” page 290: “The church with its twin towers, now seen in the middle space of Trinity Square, was a gift of benevolence to Western Canada in 1846 from two ladies, sisters. The personal character of Bishop Strachan was the attraction that drew the boon to Toronto.” Note: Scadding did not identify the names of the sisters. Bishop Strachan hired Henry Bower Lane as the architect for Holy Trinity. He had designed a section of Osgoode Hall, as well as Little Trinity Church on King Street East. Henry Bower Lane had been a pupil of Sir Charles Barry, the designer of the Houses of Parliament at Westminster in London. The Church of the Holy Trinity was constructed in the Gothic style, its interior in the cruciform plan, the altar visible regardless of where parishioners were seated. The structure’s facades were of yellow bricks from the Don Valley brickyards, and timbers were cut from the nearby forests. Its main entrance faced west, with an impressive Gothic doorway and a large window above it. Two towers were built on the northwest and southwest corners of the west facade. The slate tiles for the roof arrived in Canada as ballast in sailing ships. Because the seating in Holy Trinity was free, the church had no funds from this source and was reliant on the endowment provided by Mrs. Swale. Bishop Strachan appointed his young chaplain, Henry Scadding, who was employed as a classics master at Upper Canada College, to be the church’s incumbent clergyman. Scadding remained its rector until 1875. He died in 1901. When Holy Trinity was consecrated on October 27, 1847, Bishop Strachan invited poor families of the Church of England faith to make the new church their spiritual home. This was not an attempt to restrict the parishioners to those of humble means, but rather to fulfill the terms attached to the donation. It was the first church in Toronto to have free pews. At the time, most churches charged pew rental fees. The cost of a pew at St. James Cathedral was prohibitive for those lacking a sizeable income. In 1849, a fire swept along King Street that severely damaged the church of St. James. While it was being rebuilt, many of the parishioners from St. James worshipped at Holy Trinity, including Lord Elgin, Governor General of the province of Canada. This ended in 1850, when the new St. James was consecrated. From the mid 1800s, Holy Trinity was known as a church associated with the “Catholic Revival” in the Church of England, which sought inspiration from the Medieval days. It was viewed by some as a purer faith, as it applied more formality to the services than other churches. However, this was coupled with a keen sense of social responsibility, a commitment that was intensified when the Rev. John Frank became rector in the 1930s. It was he who introduced the pageant of the “Christmas Story,” a tradition that continues to this day. When the $200 million Eaton Centre was originally planned, it encompassed 15 acres, which included the land where the church was located. The developers wished to demolish the church and include the land within the Centre. The congregation refused to sell, and the Eaton Centre was forced to build around the structure, thus preserving this historic church and two other building (Scadding House and the church rectory). The Church of the Holy Trinity is today well recognized for its outreach program, which ministers to the needs of people in the inner city. It is a unique congregation with roots in Toronto’s past, but well aware of the people’s needs today. Map of 1845 depicts what is today Trinity Square. In that era, it was a section of the estate of The Hon. John Simcoe Macaulay, part of Park Lot #9, granted to him by Lieu. Governor Simcoe in 1797. The property was referred to as Macaulay’s Fields. The map shows the large house that he named Teraulay, a grand residence, even though he referred to it as his “country cottage.” The map shows the gardens (that included an orchard), a poultry house, stables and wood shed. The map also reveals that a carriageway connected the house with Yonge Street, to the east. Jeremy Street was later renamed Louisa Street, which has disappeared from the city scene. The eastern part of it was absorbed into the Eaton Centre. Teraulay Street became Bay Street. Macaulay Fields became Trinity Square after the Church of the Holy Trinity was erected. Teraulay Town, on the southwest corner of the map, eventually became essentially slums. They were demolished to allow the construction of the City Hall that opened in 1899. It is today the Old City Hall. The map is from the collection of the Toronto Public Library, r-5646. Sketch of the interior of Holy Trinity in 1850. Toronto Public Library, r-538. Nave and Sanctuary of the Church of the Holy Trinity in 1868. Toronto Public Library, r- 505. The camera is pointed west toward Trinity Square from near Yonge Street, in 1875. The street was formerly the carriageway that connected Macaulay’s house (Teraulay) with Yonge Street. Church of the Holy Trinity is in Trinity Square, and on the right-hand side of the photo is the parsonage, residence of the minister of the church. Toronto Public Library, r- 469. The Church of the Holy Trinity in 1884. Toronto Public Library, r- 504. View of the south facade of Holy Trinity in 1908. In the foreground workers are beginning construction of an Eaton’s warehouse. Toronto Public Library r 1461. Holy Trinity in 1913. Toronto Public Library r 536. View looking east in 1936 at the carriageway that connects Trinity Square with Yonge Street. The building in the foreground is the rectory. To the east of it is Scadding House, the home of Dr. Henry Scadding, when it was on its original location. To build the Eaton Centre, Scadding House was moved 150 feet to the west. Toronto Archives r 5724. View of Trinity Square in 1972, before construction of the Eaton Centre. The view looks east towards Yonge Street, where the marquee of the Imperial Theatre (now the Ed Mirvish) is visible. Behind the church is the Parochial Building (now demolished) and the Rectory. The large Eaton warehouse is to the south (right-hand) side of the image. Toronto Public Library, tspa 0110944. Relocating Scadding House in 1974. Toronto Public Library, tspa 0109997. This dramatic watercolour was painted in 1975, the view looking northwest from Queen Street West, near Louisa Street. It depicts the construction site for the Eaton Centre. Scadding House is on its present-day site, having been relocated 150 feet west from its original location. To the right of the church is the rectory. Eaton’s warehouses are in the background. Toronto Public Library, 977-51-1. Trinity Square in 1987, the Eaton Centre having been completed in 1979. Behind the church the roof of Scadding House is visible. To the left of the church is the rectory. On the far left (west) of the church is the immense parking garage of the Eaton Centre. Toronto Public Library, tspa 0110945. (left)The restored Scadding House in 1987, the rectory visible in the background. The Eaton Centre is to the immediate east of the house. Toronto Public Library, tspa 0110949. (right) Scadding House in 2013. Facade of the Church, with its Gothic facade and twin towers in 2013. The Gothic doorway on the west side (left), and the stained-glass window above it (right). Gothic windows, view from the interior of the church. Ceiling of the church in 2013. Interior view of the Church of the Holy Trinity in 2013. The church today remains a quiet sanctuary in the heart of downtown Toronto. Sources of In formation: Pamphlet provided to visitors to the Church of the Holy Trinity — Eric Arthur’s book, “Toronto—No Mean City,” University of Toronto Press, published 1964 — Henry Scadding, “Toronto of Old.” Oxford University Press, published 1873 — Frederick H. Armstrong, “Toronto,” produced in cooperation with the Toronto Historical Society, 1983. Toronto Eaton Centre (Phase One) in 1977, the year it opened. View gazes north, the fountain in the foreground. Toronto Public Library, tspa 0109978. I will never forget the opening of the first phase of the Eaton Centre on February 10, 1977, as it was a major event in Toronto’s retail history. On the afternoon of the day it was inaugurated, I travelled on the Yonge subway to the Dundas Street station. The train almost emptied as people excitedly pushed through the turnstiles to reach the underground entrance of the Centre. I was merely sightseeing, but I sensed that most visitors were anxious to take advantage of the opening-day sales. When Phase One opened in 1977, it only extended from Dundas Street, south to Albert Street. Despite being only half the size of today’s mall, it still appeared massive; it was the largest structure of its type that I had ever experienced. My only basis of comparison was Yorkdale Mall, which had opened it 1964. The Eaton Centre contained five levels, unlike Yorkdale that was mostly on one level, though the Eaton’s and Simpsons department stores contained many storeys. On my first visit to the Eaton Centre, at the south end where the mall ended, there was a fountain that every five minutes or so sent a stream of water skyward, almost touching the glass roof. It was quite a sight when the fountain suddenly ceased, and the tower of water plunged downward. The fountain still exists today, but I believe that it no longer has the impressive geyser of former years. The mall’s enormous indoor space accommodated many high-end shops that attracted Torontonians and tourists alike. Post card depicting the Eaton’s complex at Yonge and Queen in 1920. Prior to the Second World War, the intersection at Queen and Yonge Streets was the centre of Toronto’s retail trade, the department stores Eaton’s and Simpsons being the major attractions. After the war, many people migrated to the suburbs as they possessed more disposable funds and had purchased automobiles. The intersection of Queen and Yonge was too distant to service the needs of these suburbanites. The era of the automobile-centred shopping mall commenced. Eaton’s Yorkdale was a response to this need, and was Canada’s first large indoor shopping space. It had huge parking areas to accommodate cars. However, despite Eaton’s expansion into the suburb’s, the company had no intention of neglecting its downtown site. On March 1, 1966, Cadillac Fairview joined with Eaton’s and announced plans for a new Eaton Centre, an enormous mall that when completed would extend from Queen Street, north to Dundas. However, plans of this scope required several years to coalesce, its design and format changing several times before construction was able to begin. Its architects were the Zeidler Partnership and Bregman and Hamann. The configuration of the new mall was highly controversial. Many properties, particularly on Yonge Street, needed to be purchased and the buildings on the sites torn down. Initial plans also included the demolition of the Old City Hall and the Church of the Holy Trinity, the latter a heritage building dating back to 1847. However, citizens’ fierce objections put an end to these proposals. A modified plan allowed the City Hall clock tower and the cenotaph to remain, after the Old City Hall was dismantled. This too was refused. For the next two years, the developers negotiated with the Church of the Holy Trinity. Though plans for the demolition of the church had ended, the congregation still objected to the new proposal as the developers wanted to erect multi-storeyed buildings on the south and west sides of the church. This would entail the loss of sunlight around the church. The Salvation Army Headquarters at Albert and James Streets was another holdout, as the organization did not wish to relinquish its property. The developers finally realized that their original plans were not possible and besides, they were generating too much negative publicity. After more negotiations and compromises, city council finally approved the plans. When phase one opened in 1977, the new Eaton’s store was at its north end. This facilitated the closing and demolition of the old Eaton’s Queen Street store, so that construction of phase two could begin. Plans submitted in 1967 for the Eaton Centre. The buildings inside the outlined rectangle (bounded by Queen, Dundas, James, and Yonge Streets) were to be demolished. The Old City Hall and Holy Trinity Church were included among the structures to be removed. This plan was soundly rejected. Toronto Public Library, tspa 0108868. Gazing south on Yonge Street from near Dundas Street in 1972. The buildings on the west side of Yonge (right-hand side) were all demolished to allow construction of the Eaton Centre. In the distance, the tall building near the water tower on a roof, is the old Eaton Store on Queen Street. It was eventually demolished to make way for Phase Two of the Eaton Centre. On the left-hand side of the photo is the marquee of the Downtown Theatre. Today, the site of the theatre is part of Dundas Square. Toronto Public Library, tspa 0110147. View of Trinity Square and the Church of the Holy Trinity in 1972. The camera is pointed east toward Yonge Street. The marquee of the Imperial Theatre can be seen at the top-left-hand edge of the photo. The four-storey building on the east side of Yonge, with the large window topped by a Roman arch, is 241 Yonge Street, which still exists today. All the buildings on the east side of Yonge Street were demolished. Photo from the Toronto Public Library, tspa 0110944. Scadding House in 1973, amid the construction of the Eaton Centre. It was to the east of the Church of The Holy Trinity, the street in front of it extending east to Yonge Street. To build the Eaton Centre, it was necessary to relocated the house 150 feet to the west. In the background of the photo, the “Imperial Six Theatre” on Yonge Street can be seen. It has the large round window. Toronto Public Library, tspa 019995. (left) Relocating Scadding House in 1974. tspa 019797. (Right) Scadding House in 2015 after it was restored. Gazing west on Albert Street in 1972. All the buildings on the north (right-hand side) of Albert Street were demolished to erect Phase One of the Eaton Centre. The Eaton’s Queen Street store is on the south side of Albert (left-hand side of photo). It was demolished to build Phase Two. The Canada Life Building on University Avenue can be seen in the distance, at the end of the street. The section of Albert Street between Yonge and James Street is today absorbed into the Eaton Centre. Toronto Public Library, tspa 010996. View gazes east on Dundas Street in 1973, a short distance west of Yonge Street. Workmen are demolishing the buildings on the southwest corner of Yonge and Dundas. On the northeast corner is the famous Brown Derby Tavern. Toronto Public Library tspa 0109960. View gazing west at the site of Phase One in 1974, after the buildings had been demolished. The old Eaton Queen Street store is at the south end of the cleared site. It remained open for business until Phase One was completed. The Old and New City Halls are visible. The street that extends the full length of the photo (on the right-hand side) is Dundas Street West. Yonge Street is in the foreground. Toronto Public Library, tspa 0109954. View looking south on Yonge Street in 1975, the east side of the street cleared of buildings. The Eaton Centre is under construction behind the hoarding. Eaton’s Queen Street store is at the south end of the construction site. Beyond it, a sliver of the Simpsons store can be seen. Toronto Archives, Fonds 1526, File 84, item 60. View of Phase One as it is nearing completion in 1976. In the photo, at the south end of Phase One is Albert Street. The Church of the Holy Trinity is visible on the west side of Phase One of the Eaton Centre. Toronto Public Library tspa 0109984. View of the interior in 1976, as construction of Phase One nears completion. The camera is pointed south toward Albert Street, where the mall terminates. Behind the wall at the far end was where Phase Two would eventually appear. Toronto Public Library, tapa 0109988. Opening day of the Eaton Centre in 1977. View gazes west, Yonge Street in the foreground. The expansive glass-roofed entrance on Dundas Street is visible. Toronto Public Library, taps 010999. View of the Centre Court of Phase One of the Eaton Centre in 1977. The camera faces east toward Yonge Street. Toronto Public Library, tspa 0109970. The north end of Phase One of the Eaton Centre in 1977. Toronto Public Library, tspa 0110001. View of the Eaton Centre in 1978 from the corner of Yonge and Dundas Streets. Photo from the Ontario Archives. Terminal One (Aeroquay 1) at Toronto International Airport in 1972. Toronto Public Library, tspa 003228. The Terminal at the Toronto airport, which became known as Terminal One (Aeroquay 1) after Terminal Two was built, was one of the finest airport facilities that I have ever experienced. It was so modern and up-to-date, it is difficult to believe that a mere decade after it opened, it was beyond its capacity due to the increase in the number of passengers, the amount of cargo, and the expanded size of new aircraft. However, it remained operative for several more decades before it was finally closed and demolished. Unfortunately, it is the latter years, when it was frustratingly beyond its capacity, that people remember the most. My interest in the structure was perhaps more than the average traveller, as in the early-1960s, my father was a rodman who worked on structural steel on the site. For several years, I listened as he described the various stages of its construction. My first time aboard an airplane was in 1965, only one year after the terminal opened. The occasion was a trip to New York City. Two years later, in 1967, I ventured on my first overseas flight to Europe. On both these occasions, I flew out of Toronto’s Terminal One (Aeroquay 1). I am grateful that I had the opportunity pass through it during the days when it was among the most advanced facility of its kind in the world. It established Toronto as a world leader in airport design. I will never forget my first view of the terminal in 1965, and can easily recall my keen anticipation to see the building that my father had helped construct. It resembled the futuristic structures I had seen as a boy in space films—an enormous modernistic expanse of glass and steel that appeared as if it were intended for journeys to the far reaches of the universe. Compared to the terminals that I was to visit in the years ahead, Terminal One was amazingly convenient to navigate. At the time, other airports around the globe were long rectangular buildings in which passengers walked considerable distances to reach the gates. In Toronto’s Terminal One, due to its oval design, all the gates were not more than two minutes from the elevator doors descending from the parking garage. This was a new concept in the 1960s, and it was eventually copied by many airports around the world. It is said that after the famous author, Arthur Hailey, toured Terminal One, he was inspired to write his famous book Airport. Now that I am older, shorter distances to walk inside airports is a feature that I greatly appreciate. It is a pity that Toronto’s two new terminals did not continue this concept, as today, the distances required to walk to departure gates is far too long. In fairness, passenger numbers have grown so greatly that to employ the concept of an oval-shaped terminal today, it would have to be so large that the advantage of shorter distances would be lost. Pity! Bigger is not always better. I remember that in 1965, travelling to New York, prior to going to my assigned departure gate, I strolled around the full circumference of the concourse level to gaze at the shops, restaurants, kiosks and lounges. They were amazing. The vast surfaces of glass in the windows allowed plenteous daylight to flood the interior, so that everything was sparkling and brightly lit. In that era, adding to the delight of travelling, security was minimal. As a matter of fact, it was done so unobtrusively that to this day, I do not even recall it. On the roof of the terminal’s concourse level, there was a restaurant that overlooked the runways, allowing diners to view the departing and arriving aircraft. The ever-changing 180-degree scene was fascinating. The identifying logos and colours on the fuselage of the planes of the various international airlines created visions of faraway exotic destinations. I also remember that the food in the restaurant was not all that good, and the wine list even worse. After all, it was the 1960s. My return flight was on a Trans-Canada Airline turboprop, and was considerably noisier, but retrieving my luggage and departing the airport was convenient. It was on April 10, 1937 that Trans-Canadian Airline had been created by an Act of Parliament, to provide air flights across Canada’s enormous land mass. The airline was renamed Air Canada in 1965, the year of my first flight. In 1967, I journeyed to Europe aboard a flight on Canadian Pacific Airlines, later renamed Canadian Airlines. Because the flight was delayed for two hours, I was given a voucher to purchase food, and when I returned home three weeks later, there was a letter from the airline apologizing for the delay of my outbound flight. It was indeed the glorious age of air travel. The words “glorious age of air travel” bring to mind Wardair. This airline offered the finest inflight service that I have ever known. The company possessed a great respect for its passengers, maintaining their holidays commenced the moment they stepped inside one of their aircraft. On their jumbo-jet 747 flights, they did not employ carts in the aisles to serve meals and drinks, but delivered all items efficiently with trays. This meant that there were no blocked aisles. On a Wardair flight I took to Spain, they served the evening meal by a buffet, located at the front of the plane. Passengers were notified according to their seat numbers when it was their turn to go to the front to choose the items for their dinner. This level of service remains possible today, but no airline seems to be motivated to provide the staff and organization required. Using carts in the aisles to service passengers’ needs require fewer personnel. Terminal One opened on February 28, 1964. Designed by architects John P. Parkin, who designed the original Yorkdale Plaza, it possessed the capacity to handle 1400 passengers an hour. The concourse (passenger) level of the structure had 24 gates, which were arranged in an oval structure that surrounded a nine-storey parking garage. The terminal was constructed on the site where a terminal had been built in 1939 for what was then known as Malton Airport. It had formerly been the site of a military training airstrip where test flights had been conducted for the famous Avro Arrow. The Malton terminal was a small square-shaped structure of two storeys, with a small structure on its roof. I am not certain if it contained the control tower. It was this inauspicious terminal that welcomed Princess Elizabeth and the Duke of Edinburgh when they arrived in Toronto in 1951, on their first visit to Canada. A year later, on the death of her father, King George V1, Princess Elizabeth was to become Queen Elizabeth II. Photo above is of the Malton Terminal, which opened in 1939. It was small by modern standards, as it was built in a decade in which very few people travelled by plane. Airfares were expansive when compared to the wages earned by most people. In this era, personnel onboard the aircraft were referred to as stewardesses or stewards, and Trans-Canada Airlines (now Air Canada) required that stewardesses be qualified nurses. When travelling on a plane, most people dressed in formal attire, the men wearing suits and ties, the women donning hats, as flying was a special occasion. Prior to the building of the terminal at Malton, the city’s airport at been located on Hanlan’s Point, on the Toronto Islands. Its terminal resembled the one that was erected at Malton. The airport on Toronto Islands had been relocated to Malton as on Hanlan’s Point there was limited space for expansion and the site was often fog-bound, causing many flights to be cancelled. These were the days prior to radar. In 1960, the name of the airport at Malton was changed to Toronto International Airport. To accommodate increased passenger numbers, a second terminal opened in 1972. It was a rather ugly structure, looking more like a freight depot than a passenger terminal. In 1984, the airport’s name became the Lester B. Pearson International Airport. In 1991, Terminal Three was opened, originally named the Trillium Terminal. There were now three terminals at the airport. In 2004, a new terminal opened to replace the old Terminal One, and it became the new Terminal One. On April 5, 2004, flight 862 to London was the final departure from Terminal One, and on November 4th the same year, the terminal’s demolition commenced. In 2007, Terminal Two was demolished, so that only Terminals One and Three remained. The number were never changed, so today, the Toronto airport has two terminals — Terminal One and Terminal Three. With the demise of the old Terminal One, another of Toronto’s great architectural feats disappeared into history. The terminal at the airport on Hanlan’s Point in 1930, in the background the newly completed Royal York Hotel (opened in 1929) and on the far left-hand side, The Terminal Warehouse, which opened in 1927, and later renamed the Queen’s Quay Terminal Building. Site of the Island Airport in 1937, when summer cottages lined the shoreline facing west. The cottages and trees were later removed. In the far background on the left are the Canada Malting Silos. Toronto Archives, Fonds 200, Series 372, Item 1966. View in 1938 of the Island Airport when it was being expanded and a new terminal built. View gazes south, the western gap in the foreground. In the far distance, the lighthouse on Gibraltar Point is visible, jutting above the trees. Toronto Archives, Fonds 1244, item 1456. Opening of the newly expanded Island Airport in 1939. In the background is the Royal York Hotel, and on the far right is the Harbour Commission Building. Toronto Archives, Fonds 1244, item 4590. View on June 14, 1938 of the Island Airport, looking south, the camera on the roof of the grain elevator. On the south side of the Western Gap is the new terminal building and the expanded airfield. Toronto Archives, Fonds 1231, item 0117. Airfield at Malton in June 1939. Toronto Archives, Fonds 1231, item 1141. Undated photo of Malton Airport, the Terminal in the background. Toronto Archives. Undated photo from the Toronto Archives of the terminal at Malton. Undated photo of the Malton Terminal, Toronto Archives. Malton Airport in 1946, a Trans-Canada Airlines plane in view. The door of the gas truck has the logo of Supertest Petroleum. Toronto Archives, F 0124, fl0008, id 0004. Immigrants arriving at Malton Airport in 1947. Toronto Archives, Fonds 1257, S 1057, Item 7569. Immigrants arriving at Malton in 1948. Toronto Archives, Fonds 1257, S 1057, item 7603. Terminal One with its oval concourse level that surrounds the square-shaped nine-storey parking garage. The restaurant is on the roof of the concourse level. Undated aerial photo of Terminal One and the runways surrounding it. Toronto Archives. View c. 1965 of Terminal One from near the runways. Toronto Archives. Entrance to parking garage of Terminal One by night. Undated, Toronto Archives. Flight departing from Terminal One in 1966. Toronto Archives, F 0217, S 0249, fl 0096, item 0001. Canadian Airlines jet at Terminal One, 1989. Toronto Public Library, tspa 0003112. Wardair jumbo jet at Terminal One in 1980. Tspa 0003260. Wardair jet departing Terminal one in 1989. Toronto Public Library, tspa 00030921. Recently I dined at a restaurant located atop one of the city’s towering skyscrapers that overlooks Toronto Harbour. The ever-changing panorama was mesmerizing. The dazzling pinpoints of light from the downtown buildings illuminated the darkness, their brilliance augmented by the many streams of red and white from the myriad of cars snaking along the Gardiner Expressway, Front Street, and the Lakeshore Road. I tried to imagine the same harbour scene during the last decade of the 18th century, when it would have been enveloped in almost total darkness. The few flickering candles in the windows of the small cabins clustered around the eastern side of the harbour would not have been visible from my modern-day perch. Thankfully, we have a first-hand account of how the islands and the harbour area appeared in those long-ago decades. The peninsula is today known as the Toronto Islands, as in later years it was separated from the mainland by a fierce storm that washed away the sandbar at the eastern end of the harbour. How did the peninsula appear in the 1790s? Governor Simcoe thought that the land at the mouth of the harbour was as strategically important to Toronto as the rock that stands guard at Gibraltar, at the entrance to the Mediterranean. Thus, a carriage route was cut along the peninsula to connect the mainland to Gibraltar Point. It later evolved into Lake Shore Avenue, the main east-west axis along today’s Centre Island. “. . . a lighthouse was begun at the point of York . . . the Mohawk was employed in bringing over stone for the purpose from Queenston; and that Mr. John Thompson, still living in 1873, was engaged in the actual erection of the building . . . (“Toronto of Old,” Henry Scadding). In the decade when the lighthouse was being built, “The peninsula in front of York was plentifully stocked with goats, the offspring of a small colony established by order of Peter Hunter at Gibraltar Point for the sake, for one thing, of the supposed salutary nature of the whey of goat’s milk. These animals were dispersed during the War of 1812-1815.” (“Toronto of Old,” Henry Scadding). The lighthouse was completed in 1808, the walls six-feet thick at its base. It was “a hexagon tapered tower, 52 feet high, on a six-sided oaken crib, with a wooden lantern cage 18 feet high above the stonework. In 1832, a perpendicular addition of stone atop the tapered tower increased the height of the lighthouse by 12 feet, making it 82 feet to the vane. The lantern cage was later replaced by an iron one, when a change was made from a fixed light, burning 200 gallons of whale oil a year, to a revolving occulting light of greater power, operated by a clockwork mechanism.” (Source: “Historic Toronto, Toronto Civic Historical Committee, February 1953.”). The first lighthouse keeper, J. P. Rademuller, a German who had immigrated to Upper Canada. He kept watch at Gibraltar Point for enemy ships and friendly vessels returning to a safe harbour at York. He was in residence at the lighthouse during the Battle of York in 1813, when American ships invaded the town of York. The lighthouse was in a secluded location, and its glowing beacon was easy to spot. As a result, it became a focal point for smugglers that wished to avoid taxes on imported goods, particularly alcohol. Some sources state that it was common knowledge that Rademuller kept a supply of home-brewed ale in his home beside the lighthouse. John Paul Rademuller disappeared under mysterious circumstances on January 2, 1815. It was alleged that he had been murdered by two soldiers who had been enjoying his home-brewed beer. They were arrested but eventually set free as there was insufficient evidence—Rademuller’s body was never found. One version of the story states that Rademuller was killed after the soldiers bought the beer, but complained that its alcoholic content was low as it had become frozen during the cold winter weather. They felt that the lighthouse keeper was trying to rip them off. Whether or not this was true, most sources agree that Rademuller was killed that night and dismembered by his killers, who buried his body parts in various graves near the lighthouse. His ghost is said to still haunt the site. The painting on the left entitled, “View of York,” c. 1815,” is by Robert Irvine, and is today in the collection of the AGO. The painting depicts the lighthouse on Gibraltar Point in 1815. Irving was captured in September of 1813, during the War of 1812, and released from an American prison in September 1814. After the war, he was employed by the military and lived in York until 1817. In April 1830, records reveal that he was residing in Scotland. (Source: “Government of Fire,” Frank A. Dieterman and Ronald F. Williamson, Archaeological Services, 2001). When completed, the lighthouse was the tallest structure in the city and remained so for nearly 50 years. Its power source was switched to coal-oil in 1863 and, then, to electric in 1916. The lighthouse still stands, but it no longer guides ships as it did for over a hundred years. It is still on Gibraltar Point, although because of the silt that has built-up over the years, the tower is now about 100 meters from the water’s edge. It was decommissioned in 1958, and is Toronto’s oldest building situated on its original foundation. Sketch of the lighthouse and the lighthouse keeper’s cottage in 1894. Toronto Public Library, r-450. Undated sketch of the lighthouse from the book “Historic Toronto,” by the Toronto Historical Society, published in 1953. Today, the structure is no longer at the edge of the water. Because of the silt that has been deposited on the shoreline, it is 100 metres from the water. Gibraltar Point Lighthouse in 1915. Ontario Archives F-4336. View gazing west at the lighthouse on Gibraltar Point in 1919, with private summer cottages lining the shoreline. Toronto Archives, Fonds 1231, item 10156. Lighthouse in 1940, Toronto Public Library, 10013724. View from the base, where the stones are six-feet thick. Photo taken in 2010. Door that opens to the steps to ascend to the top of the lighthouse. The door faces east. Top of the structure where the lamp was located. The stones for the top of the towering lighthouse were quarried in Kingston. Limestone base of the tower, the stones brought across the lake from Queenston. 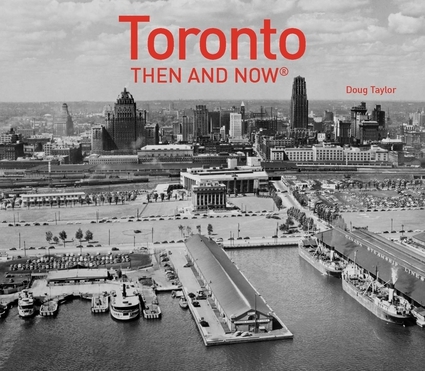 Lost Toronto by Doug Taylor, Pavilion Press, published January 2018. Photo King and Yonge Streets, Toronto Archives. When Old City Hall was slated for demolition in the 1960s, protestors united to save this key piece of Toronto’s architectural heritage. Their efforts paid off and eventually led to the passing of the Ontario Heritage Act, which has been preserving buildings of cultural value since the mid-1970s. But what happened to some of the cultural gems that graced the City of Toronto before the heritage movement? Lost Toronto brings together some of the most spectacular buildings that were lost to the wrecking ball or redeveloped beyond recognition. Using detailed archival photographs, Lost Toronto recaptures the city’s lost theatres, sporting venues, bars, restaurants and shops. Along the way, the reader will visit stately residences (Moss Park, the Gordon Mansion, Benvenuto) movie palaces (Shea’s Hippodrome, Shea’s Victoria, Tivoli Theatre, Odeon Carlton), grand hotels (Hotel Hanlan, Walker House, Queen’s Hotel), department stores ( Eaton’s Queen Street, Eaton’s College Street, Robert Simpson Company, Stollery’s), landmark shops (Sam the Record Man, A & A Book Store, World’s Biggest Book Store, Honest Ed’s), arenas and amusement parks (Sunnyside, Maple Leaf Stadium, CNE Stadium), and restaurants and bars (Captain John’s on the M. V. Normac, Colonial Tavern, Ed’s Warehouse). This richly illustrated book brings some of Toronto’s most remarkable buildings and much-loved venues back to life. From the loss of John Strachan’s Bishop’s Palace in 1890 to the scrapping of the S. S. Cayuga in 1960 and the closure of the HMV Superstore in 2017, these pages cover more than 150 years of the city’s built heritage to reveal a Toronto that once was. “Toronto’s Theatres and the Golden Age of the Silver Screen,” explores 50 of Toronto’s old theatres and contains over 80 archival photographs of the facades, marquees and interiors of the theatres. It relates anecdotes and stories by the author and others who experienced these grand old movie houses. Another book on theatres, published by Dundurn Press, is entitled, “Toronto’s Movie Theatres of Yesteryear—Brought Back to Thrill You Again.” It explores 81 theatres and contains over 125 archival photographs, with interesting anecdotes about these grand old theatres and their fascinating histories. Note: an article on this book was published in Toronto Life Magazine, October 2016 issue. The Black Bull, 298 Queen St. West, northeast corner of Soho and Queen Streets. This photo was taken prior to the renovations in 2012. The sign attached to the south side of the Black Bull Tavern states that it was established in 1833. Sources differ on the year the tavern opened, some stating the year 1833 and others 1838. Whichever date is accurate, it is undoubtedly one of the oldest watering holes in the city. However, it cannot claim to be the oldest continually serving tavern in Toronto as for several decades the building was not employed as ale house. The Wheat Sheaf at King and Bathurst outranks the Black Bull in this regard. When the Black Bull opened in the 1830s, the structures surrounding it on Queen Street were of modest height (one or two storeys), constructed of wood, many of them covered with stucco. Further west along the street, buildings diminished in number until there were only open fields and stands of timber. No one could ever have imagined the eclectic, colourful Queen West that exists today. In the 1830, the Black Bull was typical of the structures of the period — a wood-frame, two-storey building, with a steep-pitched roof. The main doorway was located at the southwest corner of the premises, allowing patrons to enter from either Queen or Soho Streets, as the tavern was on the northeast corner of the intersection of these two avenues. The large door on the west side accommodated overnight guests staying in the rooms on the second floor. For many, the tavern was central to the life of the community, which was continually increasing in size, as dwellings were being constructed to the north and south of busy, commercial Queen Street. Food and necessities for the homes were purchased on Queen Street, supplemented by two markets within easy walking distance — St. Patrick’s and St. Andrew’s Markets. It was common for shoppers to visit the Black Bull on market days. Illustration is from Robertson’s Landmarks of Toronto (Volume 1, Toronto: J. Ross Robertson’s Toronto Landmarks, 1894). A swinging sign, a wooden water trough, and pump are beside the establishment, on Soho Street. Sketch of the Black Bull c. 1912. It would appear it was inspired by the previous sketch. Toronto Public Library, r-238. In 1861, the owner of the Black Bull added a third storey with a Mansard roof. During this year, patrons in the pub hotly debated the merits of confederation with the other North American British colonies. In 1885, an extension was constructed on the tavern’s north side, on Soho Street. This was the year of the Northwest Rebellion, when John A. Macdonald sent troops to western Canada to quell the Northwest Rebellion. In 1895, the establishment possessed 50 guest rooms. In 1910, the Black Bull was again extensively renovated, a red-brick cladding employed to encase the entire building. In this year, King Edward VII died, said to be the most popular British monarch since the mid-seventeenth century. Sometime after the turn of the 20th century, the Black Bull’s name was changed to the Clifton House and it continued to serve the public for several decades under this name. However, it reverted back to its historic name, the Black Bull, in 1977. It appears that in this decade, it had a dubious reputation, the police sometimes summonsed to restore order. In April 2011, Toronto firefighters battled a three-alarm blaze that started in one of the upper rooms. Fortunately, it was contained. The latest and most popular addition to the Black Bull is the patio, on its west side on Soho Street. It opened c. 1981, and is one of the most popular outdoor drinking venues in the city. Google map, 2017 depicting the location of the Black Bull on Queen Street West. Today, the pub is an attractive Second Empire style red-brick building, with yellow-brick pilasters (three-sided columns) on the west side of the 1885-addition. The main door, which at one time was at the corner, has been relocated to the Queen Street side. The slate-rock tiles on the roof survived until 2011, but were painted yellow. During the restoration in 2012, the Mansard roof and third-floor windows were renovated, and the slate tiles were replaced with asphalt tiles. The pattern of the tiles was the same as the earlier ones of slate. Though not authentic, they are more in keeping with the original appearance of the building as they are slate coloured. A postcard sent c. 1895 from the Black Bull. It was likely obtained from the check-in desk of the tavern. The message was on the reverse side of the card, which is addressed to S. David of 45 Sullivan Street, one block north of Queen. The card gives the room rates and states that the hotel possessed 50 rooms. The telephone number has only 4 digits. Because there is no postage stamp on the card, it is possible that it was delivered by a member of the staff of the hotel, as the address was only a five-minute walk away. Card is from the Baldwin Collection of the Toronto Public Library. The Black Bull in 1972, when it was named the Clifton House. Toronto Archives, S 0841, Fl 0048, Item 0026. The tavern in 1981, when the roof tiles were painted yellow. Toronto Archives, Fonds 1526, fl 0048, item 0026. Attached to the north end of the Black Bull is #3 Soho Street, a building that matches the brickwork of the pub. However, it is in the Richardsonian Romanesque style, with heavy stone blocks at its base and Roman arches above the windows and door. The most famous civic building constructed in this style is Toronto’s Old City Hall. A PCC streetcar passing the Black Bull in April of 2012. West side of the Black Bull, with the popular sidewalk patio. This photo was taken prior to the restoration, the original slate tiles on the roof painted yellow. The patio of the Black Bull on a hot summer night. In the decade following World War II, dining in restaurants started to become more common among ordinary families in Toronto. Responding to the need for inexpensive but decent quality food, several family-style chains of restaurants began opening in the mid-1950s and 1960s. Among them were Swiss Chalet, Church’s Fried Chicken, Harvey’s Hamburgers, St. Hubert, Steak N’ Burger, KFC, and a few years later, Ponderosa. The restaurants appealed mostly to budget conscience customers, so to trim costs these chains offered a limited menu, the style of the food similar to what might be referred to today as “comfort food.” I remember these restaurants well as their openings coincided with in the decade when I first started to explore Toronto’s restaurant scene. I had landed my first fulltime job, and though earning a modest salary, was anxious to “dine out” with friends. The Winco Steak N’ Burger restaurants was one of the chains that I visited. Two of my favourites were located at 240 Bloor Street West, across from Varsity Stadium, and at 772 Yonge Street, south of Bloor Street. My visits to the Steak N’ Burger on Yonge Street usually occurred when I attended Loew’s Uptown Theatre, which was only two doors north of the theatre. The building still exists today, but is a “Le Chateau” clothing store. Visiting the Steak N’ Burger at 240 Bloor West was when I attended the University Theatre on Bloor, between Bay and Avenue Road. Similar to all the Steak N’ Burgers, the decor of these two restaurants looked like the wild-west during the days of the cowboys. Memorabilia from the old west were displayed on the walls, and in one or two sites, the chandeliers were wagon wheels. To augment this theme, the waitresses wore Stetson hats. The tables and chairs were not particularly comfortable, so did not encourage clientele to linger and chat. As a result, there was a relatively quick turnover of customers, as in fast food chains of the present decade. Although the Steak N’ Burgers were certainly not steak houses like those of today, the food was reasonably good and the price was right. When the chain began, the main menu items were roast beef, hamburgers, and a small steak, the latter a cheap cut of meat, tenderized and served well-done. I don’t ever remember a waiter at a Steak N’ Burger asking how I wanted the steak cooked. Well-done, medium, medium-rare and rare were reserved for proper steak houses, such as Barbarians on Elm Street or Carman’s Club on Alexander Street, which both opened in 1959. During the years, the menu at the Steak N’ Burger was expanded. However, when I visited a Steak N’ Burger in the late-1950s, I usually ordered the special steak dinner. It consisted of a small glass of tomato juice and a salad, which was mainly iceberg lettuce with a slice of tomato and a few pieces of red cabbage. Coffee was also included. The steak was accompanied by a baked potato with generous amounts of butter, and a bread roll sliced in half and toasted. Dessert was strawberry shortcake. Steak N’ Burger was managed by Cara Operations Limited, a Toronto-based food company that owned a 50 percent share in the Keg N’ Cleaver, now renamed “The Keg.” In 1977, Harvey’s Hamburger and Swiss Chalet were merged into a single company named Foodcorp, which was sold to Cara Operations Ltd.
Popular Steak N’ Burger restaurants were located at 173 Bay Street, 77 King St E., 323 Yonge Street, 1427 Yonge Street, and 2287 Yonge Street. However, public tastes changed, the Steak N’ Burger sites became less popular. For inexpensive dining, people preferred a pub-style restaurant. As a result, during the years ahead, the Steak N’ Burgers slowly disappeared. The interior of a Steak N’ Burger restaurant. Photo from Chuckman postcards. Undated photo of the Steak N’ Burger on King Street East. Toronto Archives, Fonds 1465, s 0299, item 0004. The special steak dinner at the Steak N’ Burger. Photo from the Torontoist. Menu at a Steak N’ Burger in Ottawa. Photo source Lost Ottawa 1980.